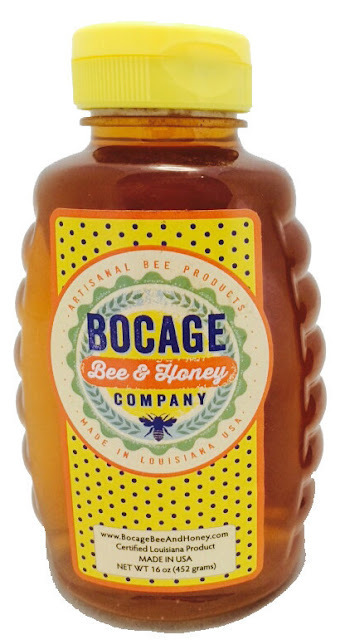 Bocage Bee & Honey often have up to 20 different varietals of honey on hand. Photo courtesy of Bocage Bee & Honey. Milou Barry can't stand to walk down the honey aisle at Albertsons. Bottles in the shape of bears or honeycombs filled with thick, golden liquid line the shelves in the well-lit grocery chain. It's not a sight that would incense a normal passer-by, but Barry, co-owner and marketer of Bocage Bee & Honey, finds it hard to tolerate. Many brands of honey on the shelves, Barry said, contain added sugar or high-fructose corn syrup, rendering the label "honey" inaccurate. "It's illegal!" Barry said, and she makes sure to tell the manager so every time. Barry's passion for honey began when she met Bocage Bee & Honey co-owner and beekeeper Elizabeth Holloway. The women met through mutual friends and immediately clicked. When Barry first tried Holloway's backyard Meyer lemon honey, she was hooked. In 2009, Barry, with a background in restaurants and catering, and Holloway, who was formerly deeply involved in New York theatre, became business partners, selling varietals of honey collected across five parishes at the Red Stick Farmers Market each Saturday. Each honey varietal's flavor is affected by a number of factors, like the seasons, weather conditions, and a hive's proximity to different pollens. Like wine, honey from the same location may taste differently year after year. Similarly, honeys can be complex in flavor, with notes of berry, sugarcane, and vanilla, and vary in smoothness. Their Old Bridge varietal, harvested from the meadows at the base of the old Mississippi River bridge, is their most popular to date. Soon, the pair were dealing in more than honey. They began selling candles, lotions, and what they call "Verry Carefully Burnt Honey," the dark, syrupy result of accidentally cooking honey for too long. Along with increasing their brand awareness and partnering with restaurants like Commanders Palace in New Orleans who use their honeycomb, Barry and Holloway also became familiar with peoples' misperceptions about bees and honey (according to Barry and Holloway, there are no studies that prove ingesting local honey combats allergies). "I tell people, 'a garden without bees is a poor garden indeed,'" Barry said. "Bees are gentle, non- aggressive creatures who do much more for us than we do for them." According to Barry, people tend to be unnecessarily terrified of bees and see them as backyard pests, but bees won't bother you unless you bother them, she said. Due to a number of factors, including irrational fear of these gentle pollinators, honeybee populations have faced an alarmingly steep decline in numbers over the last few years. Barry and Holloway, along with the EPA, believe that chemicals in pesticides used in farming along with weed killers are effectively poisoning honeybees, rendering them confused and often unable to return to their hive. "There is a huge dichotomy around us," Barry said. "The farmer makes his living tending his fields, but then he sprays them with poisons to kill the things that destroy his plants, and kills the very things who make it abundant in the process." When local bees flourish, so does local produce. Without local bees and pollinators doing their job, not only will there be no honey, but there will be nothing left to eat. Barry said saving the bees starts in our own backyards. 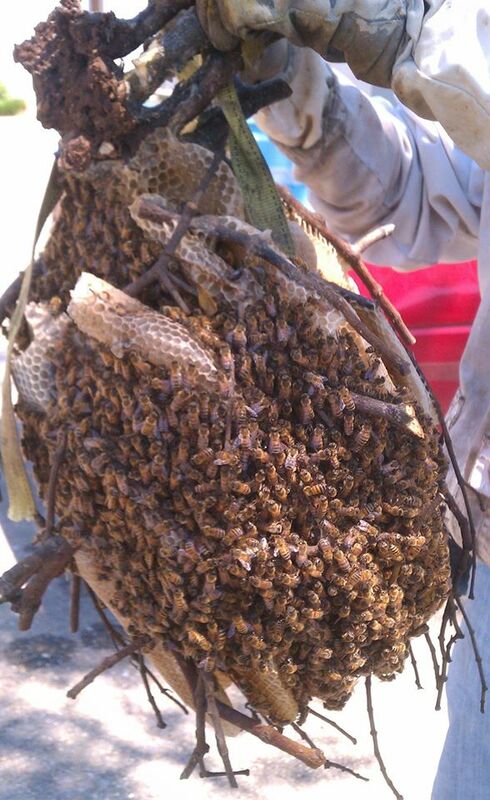 Bee hive removed from a tree. Photo courtesy of Bocage Bee & Honey. "In order to save the bees, and all pollinators, each yard must become a sanctuary," Barry said. That means giving up chemical weed killers and learning to pull them up by hand and enlisting the help of flowering plants, grasses, and edibles like fruit trees to attract pollinators like honeybees, butterflies, moths, hummingbirds, and more. Saving the bees won't happen overnight. "If you cannot see several bees during the spring and summer days, and if you never see a few moths flitting around, or there are no little blinking lights flashing on a warm evening, there is a good chance your yard has been poisoned," Barry said. Barry said it may take a few months of rains and careful tending to repair the damage, and it takes a whole neighborhood to follow the plan to revive their natural neighborhood. "Everyone needs to remember, trees are the natural habitat of bees," Barry said. "If you see a swarm of bees in your tree, please do not call an exterminator. Thank Mother Nature for blessing your yard with the creatures who will keep it alive and well."